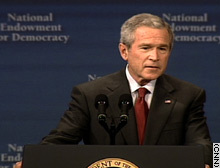 President Bush's poll numbers have slipped after an uptick from his response to Hurricane Rita. (CNN) -- President Bush's job approval rating continues to plummet, with 39 percent of Americans surveyed in the latest CNN/USA Today/Gallup poll supporting his performance, compared to 58 percent expressing disapproval. The approval rating was the lowest the poll has recorded during Bush's presidency, down from 45 percent in a survey taken September 26-28, and the disapproval rating was up from 50 percent. The latest poll results, released Monday, were based on interviews with 1,012 adult Americans conducted by telephone October 13-16. In both surveys, the questions on approval ratings had a sampling error of plus or minus 3 percentage points. Bush has seen his approval rating steadily decline since he was sworn in for a second term in January, when 57 percent approved of his handling of the job and 40 percent disapproved. In the latest poll, Bush's support appeared to have eroded even among suburban residents, who had been among his strongest backers, falling from 51 percent in last month's poll to 41 percent in the latest survey. Among urban residents, his approval rating did not budge from 34 percent, and among rural residents it was almost the same, 44 percent versus 45 percent last month. The sampling error for these and other questions that were broken down among groups was plus or minus 7 percentage points in both polls. Bush's base appeared to remain largely supportive, with 62 percent of respondents who described themselves as conservative approving of his performance, down from 68 percent last month. Support from moderates fell from 40 percent to 32 percent, and remained about the same for liberals, rising from 14 percent to 17 percent. And the GOP faithful remained overwhelmingly steadfast in their support, with 84 percent voicing approval, versus 85 percent in last month's poll. That was not the case among those who identified themselves as Democrats, whose support for Bush dropped from 15 percent to 8 percent. It appeared that many Americans do not know what to make of the travails of top Bush political adviser Karl Rove, who was interviewed again last week by a grand jury regarding his possible role in leaking the name of a CIA operative. Asked their opinion Rove, 22 percent of respondents said it was favorable, down from 25 percent in July, and 39 percent said it was unfavorable, up from 34 percent in July. But 39 percent said they were unsure, down from 41 percent in July's poll. Both questions had a sampling error of plus or minus 3 percentage points.